Technical Specification : Bottles are conveyed through air from the feeding end. The feeding end conveying is neck holding type. The bottles are picked up from the conveyor end and are inverted for washing, after washing bottles are transferred to the filling rotor where the filling is done. Filling is time based. After filling the bottles pick up the cap and go towards the capping head where the head descends on the cap of the bottle and tighten it. Caps in the bowl are oriented and brought out through the chute. The container is then released on to the out feed conveyor of the machine. Then it conveyed to shrink tunnel mounted on conveyor. 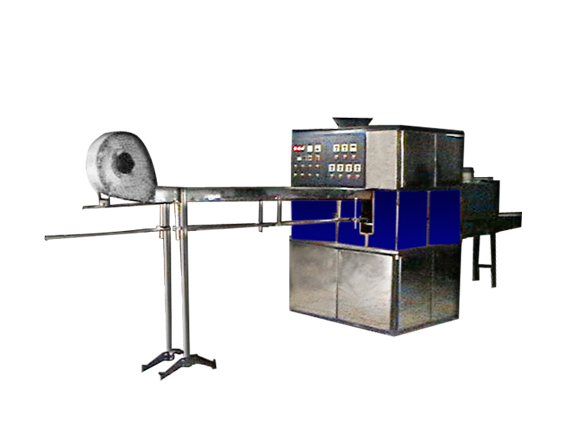 Machine is provided with vibratory hopper for cap orientation and feeding. No container V No Fill and No cap system. Contact parts in Stainless steel 316 quality. Provided with attachment of one size of pre form and one size of caps. Provided with motor gearbox and variable frequency drive. Provided with UV tubes in filling and capping area. Provided with inspection area of 2 feet. 415 Volts, 50 Hz AC 3 phase power supply. Technical Specification : Bottles are conveyed through air from the feeding end. The feeding end conveying is neck holding type. The bottles are picked up from the conveyor end and are inverted for washing, after washing bottles are transferred to the filling rotor where the filling is done. Filling is time based. After filling the bottles pick up the cap and go towards the capping head where the head descends on the cap of the bottle and tighten it. Caps in the bowl are oriented and brought out through the chute. The container is then released on to the out feed conveyor of the machine.